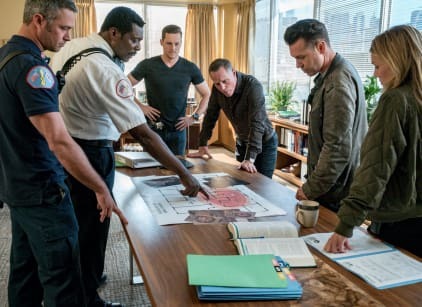 The third part of the annual crossover found PD hunting down the man responsible for the hi-rise fire that killed Halstead's father and several other innocent victims. When burn victim Jane Doe disappears from the hospital, Burgess and Halstead locate her in a nearby forest. Before her death, she tells Halstead that she is "finally free" from the man who beat her before setting the apartment on fire. They realize the attack was motivated by the need for power. Cartel member Danny Mendoza wanted to take out the cartel leader to move up the ladder. Intelligence brings in Carlos Mendoza, Danny's father and the cartel leader's driver, to get some answers. They realize that in order to make Carlos talk, they need to threaten his other son who has removed himself from a life of crime. When Carlos sees that they are attempting to arrest his innocent son, he sells out Danny. Voight orders Halstead to sit the case out since he's too close to it and desperately wants to get his hands on Danny to avenge his father. Halstead disobeys the orders and calls up Severide, who also wants revenge after he almost lost Stella Kidd in the fire. A chase ensues and both Danny and Halstead suffer gunshot wounds. Danny begs Halstead to spare him so he can have one last moment with his father and despite his anger, Halstead attempts to save him. Upton and Ruzek arrive at the scene shortly after and call for help. After Halstead is cleared by paramedics, Voight lays into him about never disobeying his orders again. I'm sorry, Jay, for everything. For not being there for you and dad. For not giving you space to grieve, We'll keep him on the vent as long as you want. Jay Halstead: She couldn't have gotten out of there too fast so where would you go? Burgess: I don't know. To find someplace to hide, some place to die. Permalink: I don't know. To find someplace to hide, some place to die.